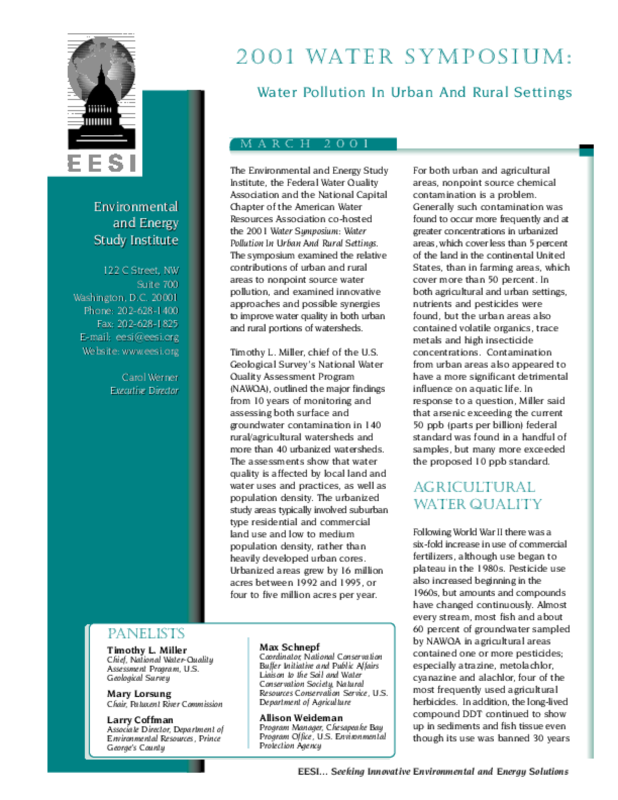 The Environmental and Energy Study Institute, the Federal Water Quality Association and the National Capital Chapter of the American Water Resources Association co-hosted the 2001 Water Symposium: Water Pollution In Urban And Rural Settings.The symposium examined the relative contributions of urban and rural areas to nonpoint source water pollution, and examined innovative approaches and possible synergies to improve water quality in both urban and rural portions of watersheds. Timothy L. Miller, chief of the U.S. Geological Survey's National Water Quality Assessment Program (NAWQA), outlined the major findings from 10 years of monitoring and assessing both surface and groundwater contamination in 140 rural/agricultural watersheds and more than 40 urbanized watersheds. The assessments show that water quality is affected by local land and water uses and practices, as well as population density. The urbanized study areas typically involved suburban type residential and commercial land use and low to medium population density, rather than heavily developed urban cores. Urbanized areas grew by 16 million acres between 1992 and 1995, or four to five million acres per year. For both urban and agricultural areas, nonpoint source chemical contamination is a problem. Generally such contamination was found to occur more frequently and at greater concentrations in urbanized areas, which cover less than 5 percent of the land in the continental United States, than in farming areas, which cover more than 50 percent. In both agricultural and urban settings, nutrients and pesticides were found, but the urban areas also contained volatile organics, trace metals and high insecticide concentrations. Contamination from urban areas also appeared to have a more significant detrimental influence on aquatic life. In response to a question, Miller said that arsenic exceeding the current 50 ppb (parts per billion) federal standard was found in a handful of samples, but many more exceeded the proposed 10 ppb standard.